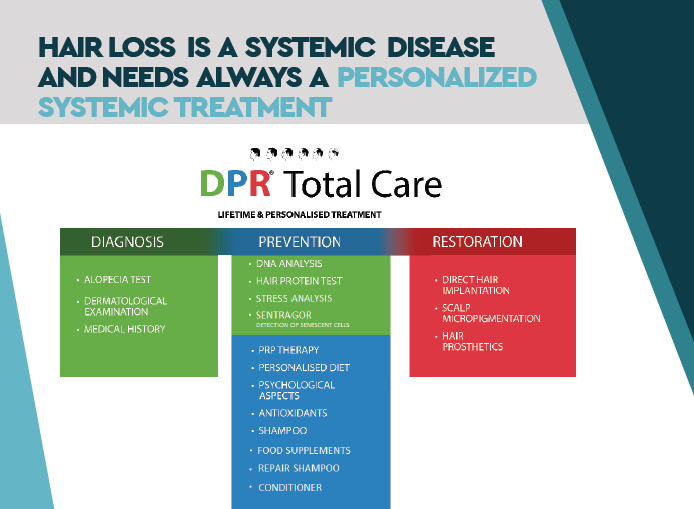 DHI is delighted to present to you that a renowned team of experts have devoted more than three years of research to develop DPR 360, a world class personalized lifetime treatment program that will change the world of hair loss Diagnosis, Prevention and Restoration. The DPR 360 program has been a collaborative development with famous professors from the Medical School of the University of Athens and focuses on the holistic and scientific approach in the diagnosis of hair loss, and the multiple factors contributing such as psychological factors, gene predisposition and dietary approaches of each patient. Holistically treating hair loss with DHI’s new program is a matter of mental health and well-being for the patient. The new DPR 360 marks a milestone for the 48-year course of the DHI Global Medical Group, as the company introduce a new era in prevention and treatment of hair loss, highlighting the significant role hair has in anti-aging and health in general. The holistic and scientific approach of hair treatment by DHI, and the multifaceted examination of factors which could contribute to hair loss (such as psychology, diet or genetic predisposition), is a unique innovation for the effective treatment of hair loss, but also for the improvement of the patient’s health and wellbeing in general.